With this image I am proud to present the deepest view ever obtained of the Antlia Cluster of galaxies, and likely the longest exposure ever reached by an amateur. Over the course of 6 months, from January to June 2015, I collected 152 hours of data on this magnificent Southern galaxy cluster. Only a few prior images exist of this cluster, and those taken with professional observatories merely cover selected narrow portions of the field, instead of the wider view of the group that is seen here. The Antlia Cluster (Abell S0636) is a compact cluster of galaxies located in the Southern constellation Antlia (The Air Pump). It forms part of the large Hydra-Centaurus Supercluster and lies some 133 million light years distant, which makes it possibly the third closest galaxy cluster to our Local Group, after the the Virgo and Fornax Clusters. The cluster contains around 234 galaxies and is unusual in that it does not have a single dominating brightest member. Instead its member galaxies are split into two subgroups, with the Northern (bottom centre) subgroup concentrating around giant elliptical galaxy NGC 3268 and the Southern (upper left) subgroup around another giant elliptical, NGC 3258. The cluster is very compact compared to other similar clusters and contains a large number of early-type ellipticals and lenticulars, including several rare compact dwarf ellipticals. 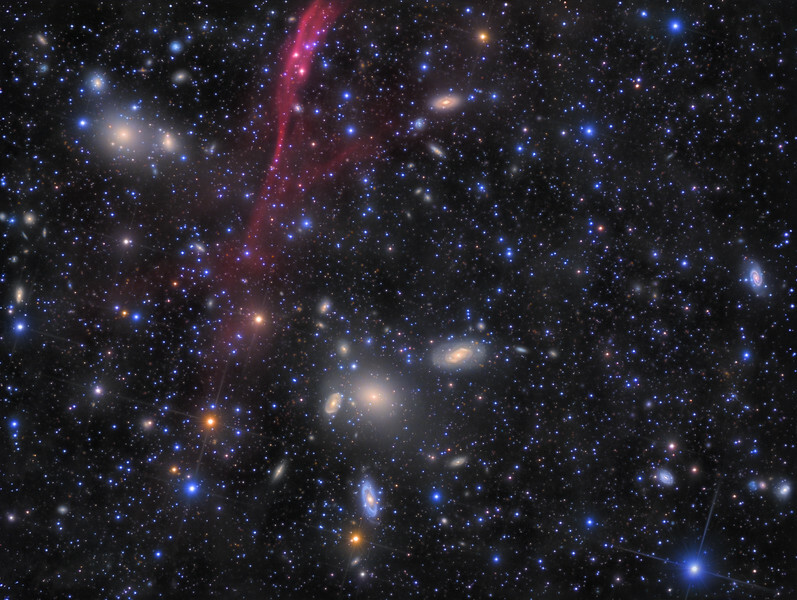 This ultra-deep image reveals that many of these galaxies are gravitationally interacting to some extent; faint tidal tails and distorted haloes are common throughout the field of view. In fact, the only large galaxy which presents an undisturbed classical spiral structure is the beautifully shaped PGC31094 near the right edge. A vast number of smaller background galaxies are visible everywhere in the image. Many of these appear grouped into distant clusters of their own, far beyond the realms of the Antlia Cluster itself. The large extended halos of the giant ellipticals NGC3268 and NGC3258 are very prominent, each filling a large portion around their respective cores with a smooth haze originating from the combined light of hundreds of billions of individual stars. Halos can also be seen around many of the other galaxies. Several of these show evidence of shell structures which are an indicator of past or ongoing mergers between galaxies. Intracluster Light (IcL) is the feeble glow of stars not gravitationally bound to one particular galaxy but still bound to the cluster as a whole. IcL is incredibly faint and difficult to detect because its brightness is typically well below 1% of the sky background. Over time gravitational interaction between the cluster members tend to strip individual stars from the outer regions of their host galaxies. Flung far out into the combined gravitational field of the cluster the glow from these stars merge to form a weak diffuse light. The structure of this light can provide important clues about the cluster's dynamics and its past history. The IcL is difficult to distinguish from the IFN (see below) which also covers the entire field of view in this image. But the upper NGC 3258 group of galaxies clearly has a diffuse trailing glow that extends right and downwards above the more massive NGC3268 group. Both groups also appear somewhat connected by a bridge of material which possibly also reaches out further down to include the delicate Sa spiral NGC3269. Delicate red filaments of the Antlia Supernova Remnant (see below) are superimposed on the space between the two subgroups, complicating the distinction between sources of diffuse light in this area. Further from the galaxies the fading IcL is drowned by the IFN which covers the entire field. A contour plot of a version of the image with reduced stars give a clearer view of the distribution of IcL and IFN light across the field. For more details on Intracluster Light see Interactions and Mergers of Cluster Galaxies by J. Christopher Mihos. Visible throughout this image is a thin veil of wispy filaments; ghostly structures that are now known as galactic cirrus, or Integrated Flux Nebula (IFN). Only a few decades ago such structures were often removed in image processing, as they were thought to be instrument artifacts or similar image defects. However, these ultra faint patches of nebulousity are real and consist of thin traces of gas and dust which is not directly illuminated by stars but merely reflect the extremely faint combined glow of the Milky Way. A faint stretch of reddish nebulousity seems to extend upwards across the top (Southern) edge of the field. This is likely associated with the recently discovered Antlia Supernova Remnant which covers 24° of the sky, centered on the Antlia constellation. This ancient structure is faintly visible in deep Ha exposures and also emits significantly in X-rays. The limiting magnitude of the image is around 25.00. Given that my earlier 120 hour exposure of Centaurus A reached magnitude 25.45 one might have expected a slightly higher limit this time, but the Antlia Cluster is only 19 degrees from the Galactic plane and thus looking in this direction is subject to higher absorption. It is also evident from the image that we are looking though a complex distribution of Integrated Flux Nebula which in effect act as light pollution in this context. However the presence of these dim clouds draped across the field of view is also hauntingly beautiful and is certainly one of the highlights of the image. Data was gathered over 55 different nights during the course of 6 months, from January to June 2015, with an accumulated total of 152 hours of data. The equipment used was a homebuilt 12.5" f/4 Serrurier Truss Newtonian on a Losmandy G-11 mount, QSI683wsg-8 CCD camera and Astrodon filters. To enhance the visibility of the supernova remnant 8 hours of binned H-Alpha data was acquired. The binning served to increase sensitivity and thus pick up more of the signal, though at the cost of some resolution. However, since the supernova remnant is primarily a diffuse large scale component, the loss of resolution was acceptable in order to enhance this aspect of the image. Data gathering began on 1st January 2015 when the Antlia Cluster reached an acceptable altitude in the East around 1am and then continued each clear night through the changing seasons until the cluster was no longer visible in the West due to trees and hills. Typically 4-5 hours were gathered on each clear night, but this naturally decreased after May 2015 when twilight began to limit the available observation time of the progressively earlier rising cluster. Each of the 1630 raw subframes were calibrated using darks, flats and bias frames obtained at or near the typical operating temperature of the CCD camera (-25C). Because the light frames were acquired over a six month period, while the seasons progressed from summer to winter, the actual CCD operating temperature ranged from initially -25C down to -32C towards the end of the project (as low as possible in order to minimise noise). All light frames were calibrated using PixInsight's automatic dark/bias scaling to account for these temperature differences. To ensure optimal calibration and flat fielding, and to minimise noise levels in the final stacked image, this calibration was done against an extensive set of calibration frames consisting of approximately 400 dark frames, 500 bias frames and 300 flat field frames in each channel; L, R, G, B and H-Alpha. Field of view ..... 47' 36.1" x 35' 50.2"
152 hours , WOW!!!! Nice little round star balls; beautiful! Congrats on the APOD feature. Отличная работа - так держать!! !